12th (Labour) Bn, The Princess Charlotte of Wales' (Royal Berkshire Regiment) which became 162nd and 163rd Coys, Labour Corps. B.E.F. 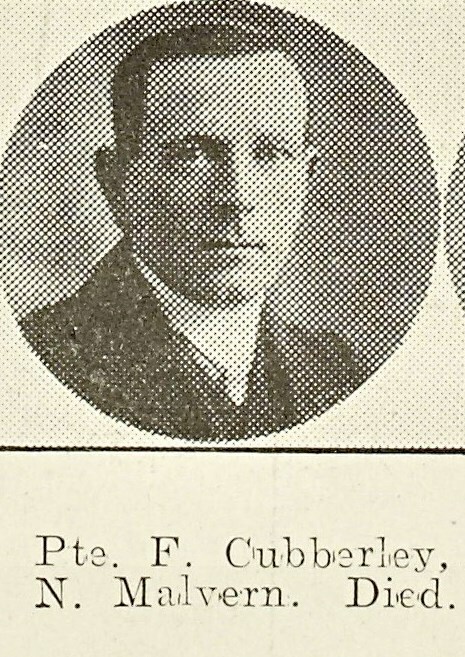 Next of Kin: Husband of May Cubberley (nee Oliver) of Cowleigh Road, Malvern. Francis Cubberley of North Malvern married May Oliver and they adopted a son, Donald. Frank enlisted at Worcester and was placed in a Labour unit of the Royal Berkshire Regiment. He served overseas with the 12th Battalion, which was formed at Freshwater in June 1916 and landed in France in August of that year. In April 1917 the Labour Corps was formed and Cubberley’s unit became 162nd and 163rd Labour Companies – so Cubberley would have been a member of one of these.